Carter Chambers: Forty-five years goes by pretty fast. Morgan Freeman and Jack Nicholson decide to do a bunch of things before they die while Rob Reiner directs them. Freeman and Nicholson save this from being pure schmaltz, and beneath it all the message carries some real substance. Great scripts rarely rise above poor performances, but good acting can make a mediocre screenplay sound almost as lyrical as Shakespeare. 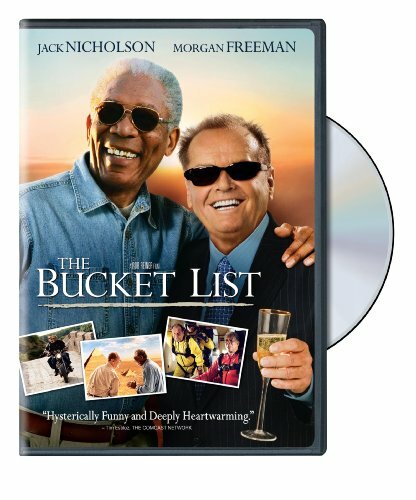 Now, no one would ever confuse The Bucket List with anything The Bard wrote, but in the hands of Jack Nicholson and Morgan Freeman, this life-affirming story about death achieves a remarkable, unexpected resonance. The two old pros instantly command our attention, and create a priceless odd-couple chemistry reminiscent of Jack Lemmon and Walter Matthau. With deceptive ease, they all but vanquish the tale's trite and syrupy elements, and like a pair of crafty Houdinis, magically make Rob Reiner's film seem far better than it is. Edward Cole (Nicholson) is a thrice-divorced, high-profile health care executive who lives a lavish, narcissistic lifestyle. Carter Chambers (Freeman) is his polar opposite�a self-effacing auto mechanic of modest means with a loving family and keen mind for trivia. The two share little in common except the "C" word�cancer�and when they're randomly thrown together in an oncology ward, where they languish for weeks enduring tests, surgery, and chemotherapy, they're forced to interact. Their awkward friendship intensifies after both receive devastating diagnoses, and the bad news inspires Carter to compose an off-the-cuff "bucket list"�a random sampling of activities and feelings he'd like to experience before he "kicks the bucket." Carter's to-do list is simple and largely spiritual, but Edward�with millions to burn�has more grandiose plans, and convinces a leery Carter to throw caution to the wind and embark on a world tour so elaborate, it would instantly bankrupt the Make-A-Wish Foundation. A simple trip to Disneyland won't do for these dying dudes, and their global adventure both broadens and crystallizes their perspective on life, love, and friendship. Several movies have trod the well-worn "live life to the fullest" path, following terminally ill characters on voyages of self-discovery and enlightenment. But what makes The Bucket List different (and better) than most of its counterparts is its earnest, no-nonsense approach. More often than not, its humor evolves naturally from the characters, and Reiner admirably tempers the story's feel-good aspects by pulling no punches in his depiction of the physical and emotional toll cancer can take, from invasive surgery and debilitating treatment to inattentive doctors and strung-out family members. The strong dose of reality early in the film makes the later travelogue all the more joyful, and adds welcome weight and emotional heft to the hopeful, comforting message. Nicholson peppers his portrayal with enough "Jack-isms" to satisfy fans, but thankfully keeps his arched eyebrows and maniacal grin in check most of the time. I liked him best during the film's hospital scenes; as a gravely ill man just out of surgery and battling the horrific side effects of chemo, he subtly transmits the weakness of mind, body, and spirit that so often afflicts cancer patients. (It's his least affected work in years.) On the flip side, there's a serenity to Freeman's understated performance that makes his character's evolution fascinating. Always believable, Freeman nails the small moments like few actors can, and his expressions of bemusement, concern, melancholy, and wonder help us grow as attached to Carter as Edward. The Bucket List, at times, feels like little more than a beefed up TV movie, but Nicholson, Freeman, and Reiner infuse it with such honesty and warmth, it winds up deserving its big screen canvas. Far more serious than a typical buddy film, but hardly a manipulative tearjerker, it strikes a satisfying balance, and should appeal to a broad audience despite its geriatric slant. These old men may start out grumpy, but soon mellow enough to teach us the importance of grabbing life's reins and appreciating every experience�large and small�while we can. It's a simple lesson, and one well worth heeding. Warner Brother has issued this as a two-sided disc, with a pan-and-scan version on one and a 1.78:1 anamorphic widescreen on the other. Sadly it is not nearly as impressive as the 1080p release, this SD version remains adequate, though far from remarkable. The transfer seems to lack a crispness, and while colors generally appear fairly vibrant, edges tend to never have the sort of definition to give the presentation a lift; some mild ringing and shimmer is evident at times, as well. Perhaps I'm just becoming a BD snob. The main audio track is delivered in Dolby Digital 5.1 surround, though just a few sequences provide any measurable full-bodied usage of all channels; for the most part the presentation is anchored by the front channels. Voices are clear, the score sounds clean and overall the mix is just quite ordinary. French and Spanish 5.1 dubs are also included. Not much in the way of extras here, and the inclusion of the always clunky DVD-ROM functionality seems kind of wasted. The offering is thin, just a pair of deleted scenes (05m:04s) in Windows Media format and something called Jack and Morgan: All Seriousness Aside, which a year after the street date is still listed as "coming soon". Bypassing the DVD-ROM content will land you a few forced trailers and two brief extras. Writing a Bucket List (04m:53s) is, as David Krauss put it in his Blu-Ray review, "a puffy five-minute featurette in which screenwriter Justin Zackham talks about the genesis of his script, and hawks a book full of bucket lists garnered from both celebrities and common folk." The presence of the John Mayer Music Video Say (03m:59s) pleased my teenage daughter to no end, though his whole soft and cuddly trip doesn't do much for me.